I feel like a lot of people get overwhelmed when they hear the word “canning”. Granted, it can be a little intimidating if you’ve never tried it before or don’t know where to start, but I promise that it’s easier than it looks. Once you’ve nailed the process the first time around, you’ll be more willing to tackle new recipes and experiment with new flavors. And, I swear, it really is easier than it seems! 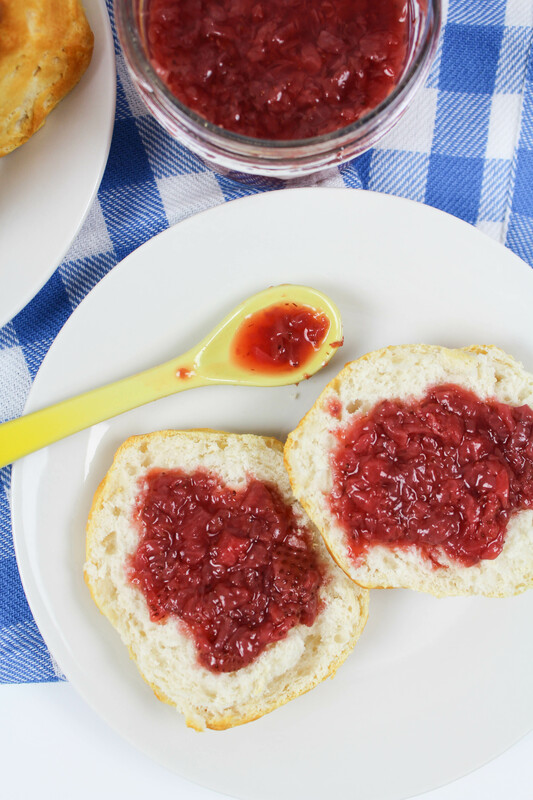 😉 And you’ll definitely want to keep canning after you taste how delicious this strawberry jam recipe is too! I ventured into the whole canning process a few years ago and haven’t looked back since. It’s a great way to use up any extra fruit you may have from your gardens during the season, or grab fruit from your local grcoery store or farmers market when it’s cheap and at it’s peak during the season. You have full control over what ingredients go into your jars and you have full control of the amount of sugar going in there too, and trust me, you don’t need much! And, not to mention, these little jars make PERFECT gifts to use during the year. They are a great little addition to gift baskets or to put on the breakfast table when you have overnight guests. 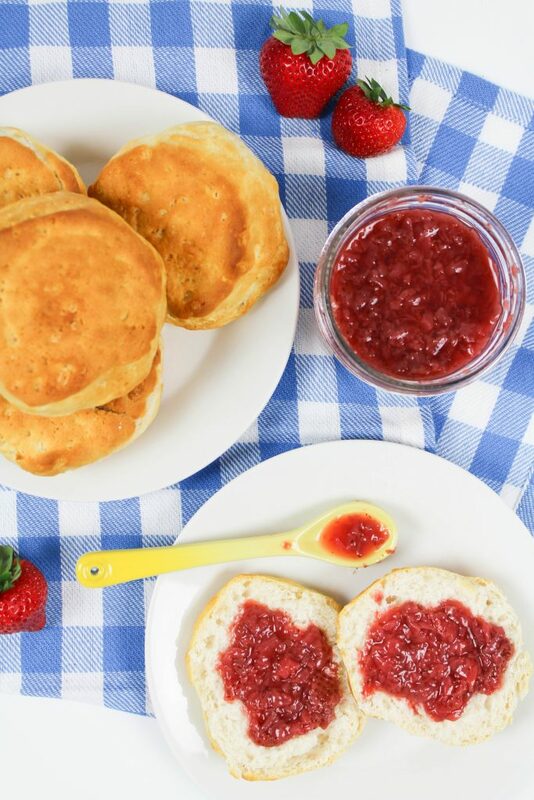 (Adding the lemon zest to the jam adds tartness and gives it a citrus bite, but I feel like it really enhances the strawberry flavor. If you don’t like citrus flavor or want a sweeter jam, omit the lemon zest). For this strawberry jam recipe, I am doing the water-bath canning method. If you’re not familiar with it, it’s a simple process and easy to do! Sterilize your canning jars and keep them hot in the canning pot. Add the strawberries and sugar into a large pot. Bring them to a simmer, stirring frequently, then continue to cook for about 5 minutes. Set a strainer over a large bowl. 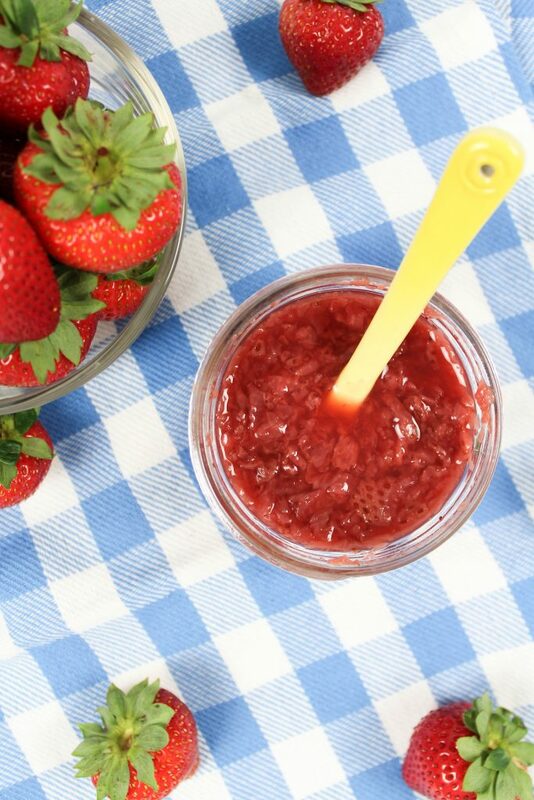 Pour the berry and juice mixture into the strainer, and stir to drain off the juice. Add the juice back to the pot and bring the mixture to a boil over high heat. Boil until the syrup is reduced to about 1 1/2 cups, or about 20 minutes. Add the strawberries back into the pot, and (if using) the lemon juice and lemon zest. Bring to a simmer. Stirring frequently, simmer for about 15 minutes. Skim off as much foam as you can, then remove from the heat and stir gently for a few seconds to mix the fruit into the liquid. Add boiling water from the canning pot into a bowl filled with your jar lids. Carefully pour any water from inside each of the jars back into the pot, and place them upright onto a paper towel or dish towel to dry. Ladle hot jam into the jars, making sure not to get any jam on the rims of the jars. (If you do get any on the rims of the jars, use a damp paper towel to wipe it off). 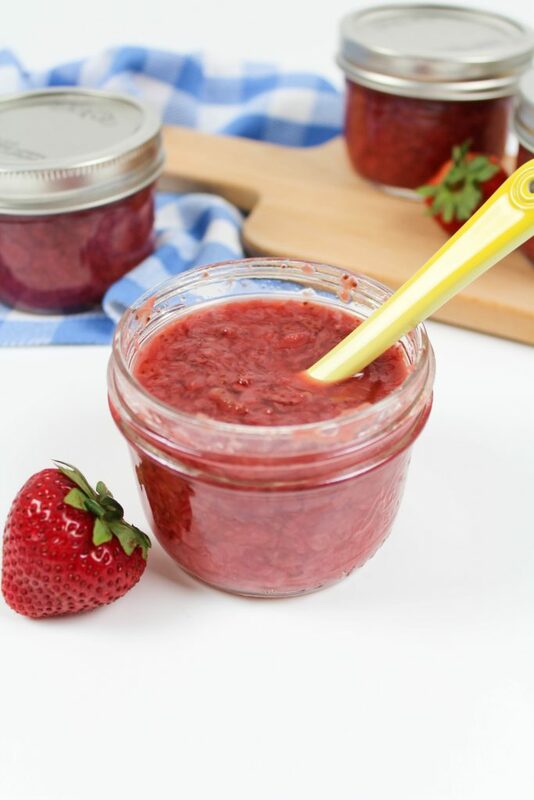 I purchased this little guy last year and it made ladling the jam into jars, SO MUCH easier. 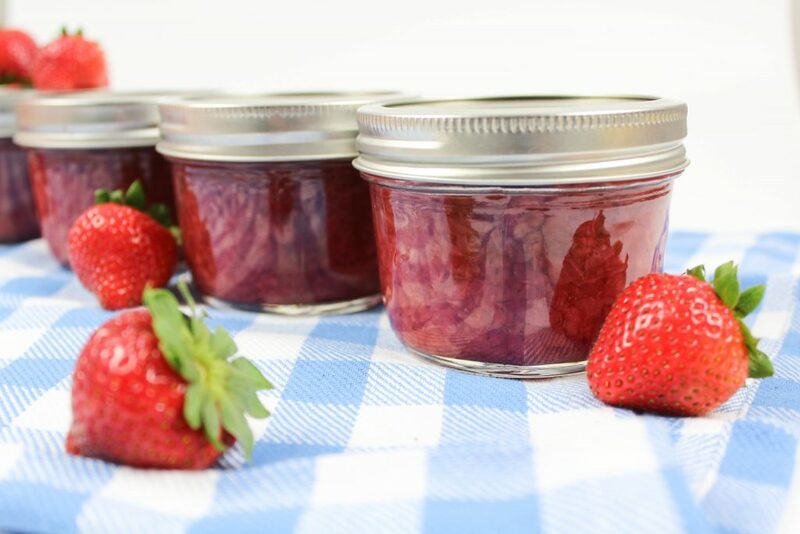 You don’t have to worry about getting anything on the rims and it also helps to give you an extra hand, since it just sits right onto the tops of the jars! Leave 1/4 inch of room at the top of each jar. Put a flat lid and ring onto each jar and secure. Do not over tighten. Return the jars to the boiling water in the canning pot, making sure the jars are covered by at least 1 inch of water. Boil for 5 minutes to process the jars, then remove and place on a towel onyour counter or work space. Do not move the jars for twelve hours. After one hour, check to see that the lids have sealed by pressing down onto the center of each lid. If you can push them down, they haven’t sealed and the jar needs to be put in the fridge and eaten within the next few days. Store the sealed jars once set. 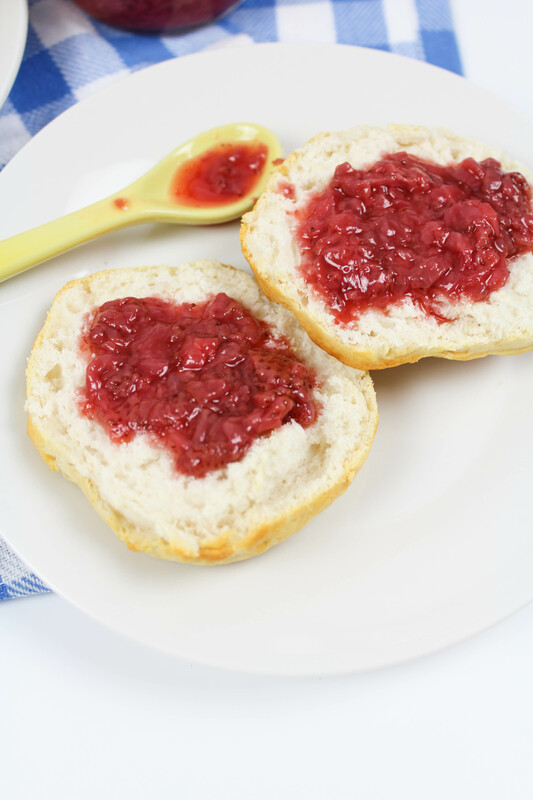 For this strawberry jam recipe, I didn’t use gelatin to make the jam more solid, but I actually prefer the natural consistency and those yummy strawberry chunks! This strawberry jam recipe is perfect to use for any sweet treat or breakfast bread, but I especially love it on fresh out of the oven scones or biscuits!